If chronic, debilitating hip pain or an injury has made hip replacement necessary for you, now is the time to learn a bit about joint replacement surgery. Understanding the process you'll go through in having that new, artificial hip joint put in and the recovery and rehabilitation period afterwards is important – both in terms of making solid health care decisions and easing stress throughout that process. To help you along the path towards educating yourself about your upcoming surgery, here are 3 important things to know before your procedure. 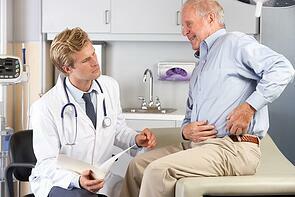 1) Hip replacement is very common today, but it is still major surgery. Hip replacement surgery is done so often these days – more than 300,000 procedures per year, according to the American Academy of Orthopaedic Surgeons (AAOS) – that it has become thought of as a rather routine procedure, especially since success rates are extremely high. However, as common as it is, it is important to know that joint replacement is a major surgery, not a quick fix. Make sure you discuss this procedure with your medical care team. Ask plenty of questions so that you know what to expect, and be sure that you clearly understand the potential risks and complications of your procedure. 2) Recovery and rehabilitation will take time – and you will need help. Surgery is just the beginning of the hip replacement process. The hard work will come after your joint replacement surgery is complete, when you will spend the next few months healing, recovering, and learning to function with your new joint in order to regain your mobility and independence. During the first couple of weeks after surgery, mobility and independence will most certainly be an issue, and you will definitely need some help. While some patients do go home – with assistance and adaptive equipment – straight from the hospital after surgery, doctors often recommend an inpatient short-term rehab program as a safer, easier, and more efficient option for getting the help and rehabilitative therapy necessary during the early post-surgery days. Using an inpatient rehab program eliminates worries about managing at home, wound care, transportation to and from therapy, medical appointments, and countless other little details that can be difficult to manage after surgery. It also gives patients a headstart on recovery and rehabilitation, since inpatient rehab offers more comprehensive and intensive treatment and therapy than can typically be provided by outpatient or in-home care options. 3) Most patients are glad they did it. According to AAOS, hip replacement surgery, which has been performed since the 1960s, is one of the most successful operations in all of medicine. Most people who undergo this type of joint replacement surgery experience a dramatic reduction in hip pain and a significant improvement in the ability to perform the common activities of daily living. While high impact activities like running and jumping are not recommended after surgery, patients are typically more than able to return to a healthy, active lifestyle, including taking part in low-impact activities like swimming, golf, biking, dancing, or hiking. That's quite an improvement in quality of life for patients – many of whom struggle to get around the house or up and down stairs – and one that makes the difficult process of recovering from joint replacement surgery well worth the time and effort.